This event allows all professionals in the sector to be informed on the latest regulatory news in the cosmetics sector, to exchange with regulatory authorities and experts. These Regulatory Meetings are aimed at company managers, creators, managers or regulatory affairs, R&D, formulators, toxicologists, quality engineers, marketers, responsible pharmacists. A presentation of the 2016 inspections detailing recurring non-conformities, control points and areas for improvement will be made by Manuela Boutillier, Cosmetics Inspector of the ANSM. . The 2017 inspection campaigns will also be announced. 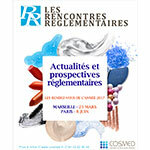 This complex and different regulation of the cosmetic regulation will be presented Cécile Rousseau, Senior MRE Consultant.